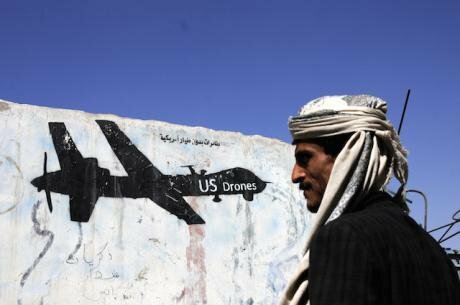 Yemeni man walks by painting of US drone on the wall in Sanaa, Yemen,shortly after 25 civilians were killed in latest US counter-terror raid, January, 2017. Xinhua/Press Association. All rights reserved. Five terror attacks in the UK made 2017 an annus horribilis for those defending the nation against terror. The UK government is about to publish an update to its counter-terror strategy, CONTEST. At the recent Westminster counter-terrorism conference, a top security official affirmed that the heightened terror threat in the UK is strongly connected to conflicts overseas – especially the situation in Syria and Iraq and those inspired by Islamic State (ISIS). The new strategy needs to ensure coherent UK support for peace overseas if it is to reduce the threat at home. The 2011 version of CONTEST, however, placed no emphasis on bringing conflicts overseas to a lasting end. The new strategy must instead strongly promote effective UK engagement in peacebuilding, and break with policies that have been proving highly counter-productive. It isn’t possible to defend against all threats, and terror tactics are evolving to make defence harder. Despite the 2017 attacks, the UK security establishment leads the world in detecting terror plots, and taking down the individuals and networks planning them. It gets insufficient credit for a job well done. Perhaps because domestic counter-terror structures are so strong, the country hasn't yet elaborated a very strategic approach to the international dimensions of the terror problem. Yet the global picture is not pretty: from 2000 to 2016, global casualties from terror attacks increased seven-fold. The ranks of violent Islamist movements are thought to have more than tripled from 2000 to 2013. Britain’s role in the international war on terror during this period, and the evidence from very sobering British experiences in Afghanistan, Iraq, Libya, Somalia, Syria, Yemen and elsewhere, should be shaping the UK's outlook. Two tendencies have prevented the UK from improving its international approach. The first is the way the UK domestic debate revolves around the idea that ‘there can be no excuse for terrorism.’ This vein of thinking appears to make the very idea that better foreign policy could reduce the threat to the UK a treasonable offence. Witness the contortions Boris Johnson recently had to muster to make the simple observation that dictators are making the terror problem worse. Yet it is surely obvious to the British public, as to most experts, that the threat in the UK is deeply connected to conflicts overseas and the grievances that underpin them. Terror attacks overwhelmingly occur in conflict zones and repressive environments, and the threat faced by the UK is increasingly connected to what is happening in these places. Whether we like it or not, the Palace of Westminster, Manchester Arena, London Bridge and Parsons Green attackers – and indeed the July 7 bombers – were either connected to or inspired by groups fighting in wars in which Britain has played an important role overseas –people who probably believed their actions were either part of or vengeance for these struggles. No one is claiming that the violent acts of such people can be excused. Policymakers must, however, remain open to improving their response strategy. Part of this has to be understanding conflicts that are connected to the terror threat in the UK, and working with the international community to address what drives them in a logical and principled way that actively learns from past experience. The second tendency is that pressure to avert domestic attacks pushes policymakers into taking short-term actions that add up to long-term failure. This underpins both attempts to eliminate violent groups without a coherent strategy for preventing their rebirth, and backing for problematic ‘allies’ to curb violent groups and stop them crossing borders. When the UK supports other states to build stability and fight terrorists, it often strengthens the hand of abusive, corrupt and repressive ‘allies’ whose behaviour is at the heart of the problem – and who often misuse assistance for their own ends. If they make the problem worse, they may well gain yet more assistance. As the US tragically learnt in Vietnam, a local ally that lacks the will and integrity to get the public on board will struggle to win public support and overcome its opponents. The failure of the US, UK et al in Afghanistan rests substantially on the failure to learn this lesson. A recent New York Times article reported that: ‘On 5,753 occasions from 2010 to 2016, the United States military reported accusations of “gross human rights abuses” by the Afghan military, including many examples of child sexual abuse. If true, American law required military aid to be cut off to the offending unit.’ Yet, on no occasion did that happen. Although for years it has been clear that the Afghan public is deeply concerned by the corruption and abuse of the post-Taliban order, foreign assistance has continued to flow into government coffers at a rate that the Afghan state could never hope to sustain in future years. It is perhaps too late to speculate on what could have been achieved with a policy of tougher love: less resources might have flowed to the state; foreign powers might have been more willing to challenge and withdraw support for abusive, corrupt individuals; civil society and communities might have been offered a greater role in challenging and shaping the post-Taliban state. But it is not too late for the UK to learn from Afghanistan. After years of stabilisation and counter-terror assistance, Somalia’s 2017 elections were described by analysts, investigators and some western diplomats as ‘a milestone of corruption, one of the most fraudulent political events in Somalia’s history’. This was some feat, in that Somalia is ranked by Transparency International as the world’s most corrupt country. ‘This election has been awesome for the Shabab’, as one Somali anti-corruption campaigner explained. After the US-backed Ethiopian invasion to prevent Somalia becoming a hot bed for terrorists in 2007, the Somali government was put together and propped up with external backing. To this day, shaped with only limited public input, beset with corruption and delivering little to Somalia’s long suffering people, it ‘has no authority, no popular support’. Resting on such a shaky political foundation, Somalia’s security forces have again and again proved a fragile repository for the equipment and capacity support lavished on them. A senior official familiar with the matter told me recently that Somali security forces trained by the African Union have been deserting in large numbers with their weapons. Many of them had probably joined armed groups fighting the government and foreign forces, such as al-Shabaab. What is staggering is that this pattern occurred in both of the previous decades, putting thousands of weapons and other equipment into the hands of Somalia’s armed groups. In addition, abuses against civilians committed by Somali security forces trained and armed by the west with little accountability continue to provide a fertile recruitment ground for al-Shabaab. Western backing for abusive, corrupt and exclusive counter-terror partners attracts the ire of those they marginalise and oppress. The Egyptian state continues to enjoy military and political support from the UK to counter terrorism. Egypt has branded any and all opposition to the regime – in particular supporters of the Muslim Brotherhood, the party of deposed but democratically elected president Morsi – as terrorists, incarcerating and torturing thousands of Egyptians. Civil society organisations have borne the brunt of a massive crackdown. As violence predictably spirals in reaction to the ever-more-inhuman cruelty of the Sisi regime, the blanket support offered by the UK government is irresponsible and counter-productive. The UK witnessed the unpredictable results of ‘capacity building’ for abusive foreign security forces when its initiative to train Libyan armed forces in Cambridgeshire closed following a string of sexual assaults and reportedly caused almost £0.5 million of damage to the training barracks. In fact, security ‘train-and-equip’ programmes that play into the wrong hands are far from the exception. In the 275 military coups between 1970 and 2009, the US trained the armed forces the year before in 165 of them. Despite huge US and UK support for the Iraqi army, it readily capitulated to Isis, who promptly gained huge volumes of western-supplied weapons. In Yemen, where the UK played a key role in convening ‘Friends of Yemen’ to offer the country stabilisation and counter-terror assistance, then-President Saleh’s regime misused such assistance for years to suppress domestic opponents. After its cruel, corrupt rule collapsed under the weight of popular discontent, many of the state's foreign-supplied weapons ended up in the arsenals of violent rebels and Al-Qaeda in the Arabian Peninsula. Funneling money, arms, training and political legitimacy to governments at the front lines of the war on terror has proven akin to dousing a fire with paraffin. The wars in Afghanistan, Iraq, Somalia, Syria and Yemen – all war on terror battlegrounds – are far from over. This is partly because the transformation in political conditions – the social contract – that people in these contexts need and deserve has never been achieved. Corruption, abuse and exclusion has enabled those who oppose state authority to maintain a considerable social base, and UK assistance has done too little to turn this picture around. What is, then, the right strategy? Well, it is obviously vital to detect and disrupt violent groups plotting transnational attacks, prosecuting and sentencing offenders in human rights compliant ways. There may always be violent individuals opposed to liberal democratic societies like the UK. However, it seems plausible that the UK would be much better inoculated against the general enmity of hundreds of millions of people living in repressive contexts if it lives up to its best ideals abroad. It may be necessary to use force judiciously at times to protect human life and prevent vicious, repressive movements taking control over people's lives. But because violence always brings blowback – especially if used indiscriminately – violence has to be the very last resort, and only ever used discriminately and accountably. And because past efforts to eliminate dangerous groups without addressing the conditions that gave rise to them have failed, it should become UK policy only to deploy force in the context of a coherent wider strategy that is focused on achieving peace. Indeed, achieving peace in conflict environments needs to be reasserted as the highest strategic aim of UK foreign policy. Guided by this recalibration of priorities, the UK and its allies must develop a new discipline: extending greater support and cooperation towards partners that respect human rights, that are tackling corruption, security force behaviour and political inclusion; and refusing to ally with governments whose behaviour is the best possible recruiting sergeant for violent groups. And in all contexts the UK must work with society to press for peaceful conflict resolution and improved governance. The proudest moment in British history, that has come to define its self-identity, remains its dogged opposition to the abuses of Nazism and communism. If Britain fights ISIS hand in hand with regimes that behead dissidents, and tear the fingernails from their journalists, and if it destroys whole cities while failing to provide for refugees and reconstruction in the process, then the justice of Britain’s cause is diminished, and it can expect the enmity of those who suffer the consequences of what will readily be seen as a reckless and unprincipled approach. Since 2001, Britain has compromised its passion for the rights of people in conflict environments in the name of counter-terrorism, and this has undermined its national security – winning enemies faster than they are eliminated. It is time to resurrect Britain’s identity as a nation that stands against repression, and for just peace for conflict-affected people.